Need New Windows? 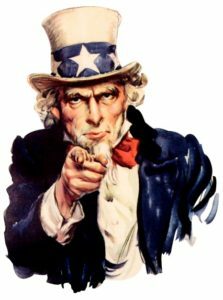 Let Uncle Sam Help Pay for Them! Luckily windows don’t need to be replaced too often because they can be expensive. You may not think of windows as high-end technology, but they’re starting to become just that. Not like in a Minority Report sense where the glass doubles as an iPad, but rather that windows are becoming more energy efficient. They either let in more heat or less heat, and inversely, they either trap or release the heat already in your house. This not only saves you money on both heating and cooling costs, but it also cuts down on fossil fuel usage which helps everyone (Except oil barons, I guess). Which is where Uncle Sam steps in. If you’ve been paying attention to the news at all for the past 1-30 years, you’re probably aware that climate change and the depletion of our natural resources is kind of a big deal. Well the window business is doing its part to help out. They’ve been developing Low-E Glass, which stands for Low Emissivity. Emissivity is essentially the measure of an object’s ability to emit infrared energy. 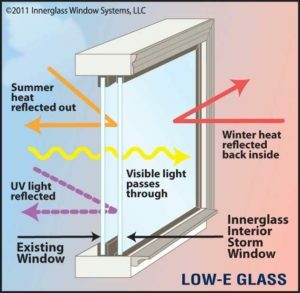 So the Low-E Glass does a much better job of reflecting thermal energy by using a special veneer to allow visible light while keeping heat out and/or trapped in. If you guessed that these windows were considerably more expensive than normal windows, you would be correct. That’s why the government has decided to step in and subsidize anyone who decides to make the environmentally conscientious decision and upgrade. The Energy Trust of Oregon was already offering to pay $1.75 per square foot of glass if you install energy-efficient windows. However, these new Low-E windows are so efficient – and subsequently expensive – that the Oregon government will pay up to $4 per square foot of windows. For the typical Oregon home, that amounts to about $1,200 in savings. Factor in the savings on your heating and cooling bill, and in a few short years, these windows will have paid for themselves. Not too shabby of a deal. So if you’re looking to help the environment, get some killer new windows, and save a little money in the process with an assist from everyone’s favorite Uncle, consider installing some new Low-E Windows. In general, exterior remodeling projects tend to be a seasonal business. Window replacement projects are no exception. Most people do these types of projects in the summer or early fall, making 7 months of the year (between April and October) the peak season. During this busy season, manufacturers shift their production lines into high gear, installation schedules fill, and lead times increase. Conversely, in the winter things slow down, lead times are shorter, scheduling delays are far less common, and many companies struggle to keep their crews busy. For some types of remodeling projects this is unavoidable. However window replacement does NOT fall in this category. Window installations can be easily done year round, and in almost any weather condition. Instead of shying away from work in the winter, Windows Only has chosen to specialize in them by developing special techniques, and offering discounts to customers who choose to take advantage of a winter installation. We invite you to join hundreds of homeowners who have saved money, and experienced just how easy a winter installation can be when you hire Winter Window Installation Experts to do the job right. Myth: You shouldn’t replace windows when it is raining. Fact: When properly installed, rain alone has little or no affect on the window replacement process. The only weather conditions of serious concern are ice, snow, and/or heavy wind, and often these conditions only affect certain locations in the Portland area. Throughout the course of an Oregon winter, only a handful of days are truly unsuitable for most window installation jobs. Myth: My house will be open to the elements for days during window replacement. Fact: Even in the summer we replace only one window at a time, and each window opening is only exposed for a couple minutes. During inclement weather our winter installation experts take the extra precaution of covering the opening with plastic so that even for those few minutes of exposure, heat loss is minimized, and moisture is contained. Fact: The vast majority of the work performed is from the exterior of the home. Regardless of the time of year and the ground conditions, our installers leave your home clean and free of debris. Price: Our installers are the best in the business and we are committed to keeping them busy year round. Our solution to the winter slow time is to offer customers winter discounts of 5-10% lower than our already low prices in the “peak season”. See here for more details. Lead Time: We can typically do a project (from contract signing to completion) 2-3 weeks faster in the winter. This is due to shorter lead times with Milgard as well as our own installation schedule being more open. Better Service: We maintain the highest standards of customer service and quality 365 days a year. However, it is undeniable that the busier we are, the more challenging this can be, so by definition errors are less likely in the winter than during our peak season. Immediate Results: Winter time is when you will enjoy the biggest benefits of having new, energy efficient windows. Increased comfort and reduced heating bills are more important in the winter, and it is the time of the year you will experience the most dramatic difference between the day before, and the day after installation. For most of the 19th & 20th centuries window design was limited to the single pain design. This as it turns out is an extremely in-efficient design for dealing with thermal energy. Ideally your home is designed to modulate the flow of heat. Preserving it in the winter and releasing it in the summer. Standard windows however tend to allow heat to act as it please passing back and forth without much resistance at all. Some studies have shown that single pane windows allow as much as 10 times the amount of heat to escape compared to the same area of insulated wall. That equates to around 15-22% of a heats home annually. By using drapes, curtains or blinds to add an additional layer to your windows will not only help with your home’s heat retention but also help keep another problem out: radiation. Radiation energy in the form of heat can pass through glass with ease warming the air and fading your furniture. One simple and inexpensive option is to install translucent low-emissive window coatings. Though thinner than a human hair, they have the capacity to tint the interior of the house and reflect portions of UV radiation. When considering whether to replace the windows in your home another thing to consider is the window style and the way they hang. 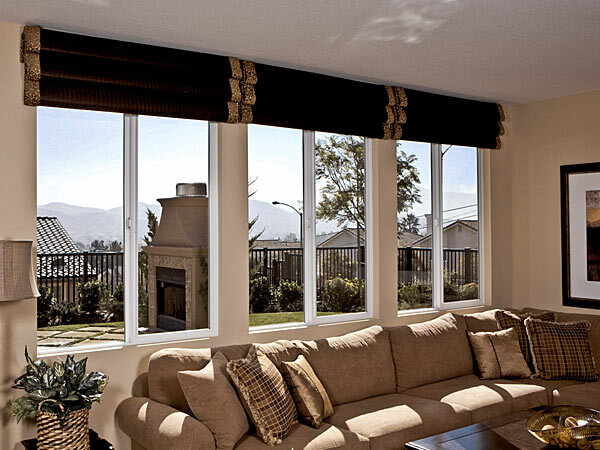 This may help or hinder heat loss or retention through the drafts these windows create. Also double checking and verifying the brands energy-efficiency rating (also known as the “R-value”) can help you make the correct decision before shelling out thousands of dollars on retrofitting. Windows can be one of the first places a home loses its temperate air, and it can also be one of the best places to increase energy efficiencies. Getting the best Portland window replacement for your home will be an investment that saves you money in the long run. It costs money to heat and cool your house, and newer windows will keep air from fluctuating in and out of your home so you can keep your desired temperature without using additional energy. Here are a few ways upgrading your windows can save you money in the long run. If you’re home has newer, high-efficiency windows, they’ll work much better for sealing in that cool air and not letting it seep out through window leaks and other inefficiencies. 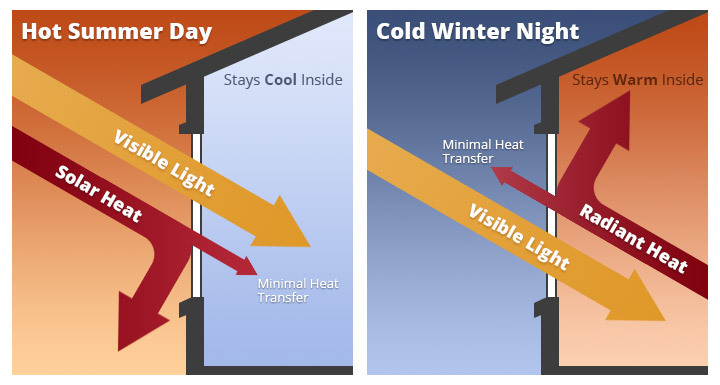 When it cools off at night, you can use your windows to trap that night time cool air. Open your windows before bedtime to let the cool air in, and in the morning close those windows to create a natural ventilation system which keeps the cool air indoors. Once you’ve upgraded your old windows, you can use your A/C more efficiently. If you have an air conditioning system for the summer weather, well insulated windows play a big role in keeping your system running efficiently. If your home has older windows, some of that precious A/C air can be leaking out of the older sealing. Newer, more energy efficient windows shield your home better from the summer heat. Most Energy Star certified windows will significantly reduce the heat that’s allowed into your home from the sun’s rays and outside heat, much more than standard, double-pane windows. Energy Star certified windows have coatings that actually keep out the summer heat from your house, and act like a giant sunscreen to your home, reflecting the heat without keeping out any of the natural light. A Portland window replacement company can help you save money on energy costs, but there are other organizations that can help you save in other ways, too. Energy Trust is a nonprofit organization in Oregon that offers cash incentives for qualifying energy-efficiency and renewable energy projects in homes and other businesses. You must apply for an Energy Trust cash incentive by filling out an application and attaching all receipts or supporting documents within 90 days of the home installation. If your application is accepted, you should receive a check within 6 – 8 weeks afterwards. Something we hear a lot are questions about solutions to drafty windows. Now of course we might be a little biased about replacing your windows as that is what we do, but the fact is sometimes there are other options. Most of these are short term solutions to long term problems, but if you’re just not quite ready to tackle the Portland window replacement project in your home, then these might be options that could work for you. 1.) Window insulation kit – You can find one of these at virtually any hardware store, or online. This is essentially a large piece of shrink wrap for your windows. You will likely have to have someone help you with the installation. Fair warning about this option, it will give your windows a shrink wrapped look. However it will do the job of cutting down on your heat loss due to drafty windows during the winter. 2.) Caulking – They make window specific caulking that dries almost perfectly clear. Most people think all the drafts are coming from the windows themselves. But a good portion of the drafts could be coming from the framing around the windows too. Take the caulk and run a bead around the window. You can also grab an exterior caulk and run it around the outside. You should instantly notice a reduction in drafts. I like this option because it could potentially fix your drafts permanently without creating an eye sore. However, you will still notice drafts around the window sashes, so you will still have some draft problems. 3.) Draft snakes – Barely an option. You put the cloth “snake” at the bottom of your window. You will notice a lot of people use these for their drafty doors. The problem with the draft snake is that it will only prevent drafts at the sill of the window. You still have three sides to worry about not to mention the window sashes. Again, barely an option. 4.) Rubber sealing strips – Sealing strips are easy to use and will definitely prevent drafts. However, odds are if you are using the sealing strips, they are going to be sticking to your windows or inside trim for a few months. By the time you go to rip them off, you will have a sticky residue that is a nightmare to get off. And, like many of the options, sealing strips will undoubtedly provide you a “tacky” look to your windows. 5.) Replace your windows – What did you expect? We are a window replacement company after all. If your windows are giving you that many problems…it’s time to replace them! With a quality window and quality installation, you can virtually eliminate drafts and give your house a nice new look. Plus, with the advancements in glass packages, you can really end up with a window that will save you money in the long run. You will have to invest some money now and count on the savings over the years to earn your money back. But in my biased opinion, replacing your windows is the best option. If we’re going to be honest with ourselves, windows are probably one of those aspects of your home that you don’t pay much attention to, aside from the occasional washing or staring into your garden. It seems unusual that we take these important components of our living spaces for granted, and are unaware of how faulty windows can actually cost us time and money. You might never have given a thought to replacing or restoring your windows, but here are 5 tell-tale signs that you probably should. Older windows, particularly those made out of wood, are prone to rotting, cracking and warping from water damage over time. Cracked or rotting window trims lead to mold growth and peeling paint is a sign of overexposure to the elements. If your window trims are looking a little worse for wear, it’s probably time to replace your windows. If all the windows in your home are closed, but you still feel a draft – your windows aren’t doing their job. Odds are that the seal has been damaged or broken, and moisture leaking into your home can cause cracked trims, mold, and even damage to your furniture and carpets. A simple way to test for a draft is to do the candle test. Just hold a burning candle up to a closed window and if the flame flickers out, you need new windows. Pay attention to the temperature of your windows during the season’s change. If your windows are very cold in the winter and warm in the summer, that means the insulation is not up to par. When your windows aren’t properly insulated, it will put pressure on your home’s HVAC system. This leads to higher heating and cooling costs, and almost literally throwing money out the window. By purchasing new windows, you can actually cut costs in the long term. Especially with today’s energy efficient window options. 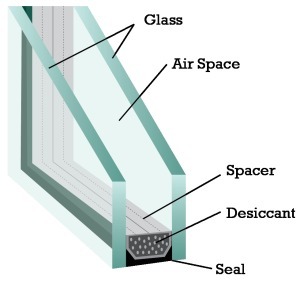 Most windows are double pane or triple pane and the panes are designed to keep moisture out. However, when windows frost or ice over in the winter, it is a sign that condensation has built up inside the pane. This leads to cloudiness. Cloudiness impairs visibility and can make your home look unkempt, even if it isn’t. Window restoration would help in this situation, but isn’t always the most cost effective option. If you are going to pay nearly as much to repair your windows as it would be to replace them with more cost efficient ones, then the choice is clear. 5. Sticky or Stubborn Windows. Windows that are difficult to open or close, or can’t stay open without some sort of prop, are not only inconvenient, they’re also inefficient and unsafe. Sticky or stubborn windows are often a sign of a house settling or the pressure on the window changing. Either way, the windows will no longer fit perfectly and won’t be functioning as they should be, so they’ll need to be replaced. If you think your windows might be in need of an update, don’t hesitate to call an expert. At Windows Only, we’d be happy to help you determine what your needs are and come up with a solution that suits both your home and your budget. We have many online pricing options so you can get a quote without ever having to leave your home. Just imagine living in a house with no windows. No natural sunlight, no view, and no natural heating in the summer. It would be like living in a cave. However necessary they may be, there is a downside to having windows. They account for about 10% to 25% of your heating bill by allowing heat to escape from your home during the colder months. In the summer, your air conditioner has to work extra hard to cool the hot air radiating from your windows. There are plenty of things you can do to make your windows more energy efficient. Of course you could replace your old windows with newer, more energy efficient models, But try some of these other tips as well. One thing you can do in the summer months to ease the load on your A/C unit is to use shades and curtains to keep your windows from getting heated by the sun. In the colder months, you can also tape a clear plastic sheet over the inside of your windows to prevent heat loss. Installing exterior or interior storm windows also helps, and can reduce heat loss by as much as 50%. If you live in a home with single-pane windows, you may want to consider upgrading to to a newer more energy efficient double-pane window. They are much more efficient and look just as good. If you live in a colder climate, it’s a good idea to get gas-filled windows because they are great at reducing heat loss. For warmer climates, you can buy spectrally selective windows that reduce heat gain. 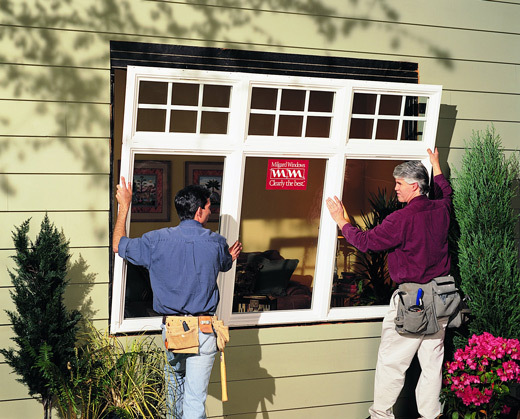 Windows Only is a highly trusted company that specializes in Portland residential window replacement. Replacing old and worn windows can actually save you money over time in energy bills, and can also make your home a more comfortable place during any season. 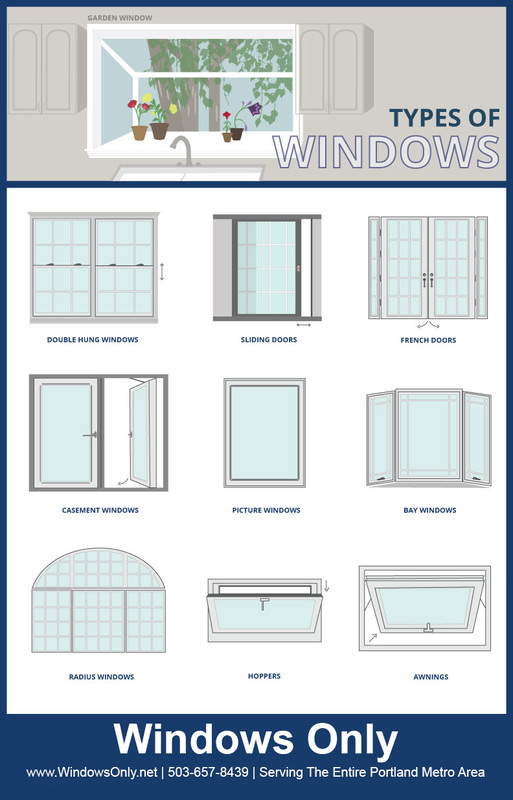 The info-graphic above shows just a few of the different kinds of windows that we offer at Windows Only. These include Double Hung Windows, Sliding Glass Doors, French Doors, Casement Windows, Picture Windows, Bay Windows, Radius Windows, Hoppers and Awnings. At Windows Only we carry only the best products from industry leading manufacturers and we take pride in making sure that every install is done correctly the first time, that is why we offer a lifetime labor warranty. Our team of trained expert technicians work fast and efficiently ensuring that you get the best product for your money without the hassle of waiting or dealing with less than professional work. We have been serving the entire Portland Metro Area for over 20 years. We take pride in being one of the top Portland Window Replacement companies. Let us show you what make us different from the rest. With winter just around the corner, many homeowners will want to complete their window replacement projects before the cold weather sets in this year. The vast majority of savings from energy efficiency improvement projects will be realized during the winter months. Replacing single pane, aluminum, or outdated wood windows with new energy efficient Milgard vinyl windows is a very wise investment, with a very good return. Windows Only is a certified Milgard window installer, and a trade ally of the Energy Trust of Oregon. Qualifying projects will be eligible for cash incentives for window replacement projects. Current rebates offered by the Energy Trust of Oregon range from $2.25 (for U-Value of .30 or better) to $3.50 (for U-Value of .25 or better) per square foot of windows replaced. Due to the sudden increase in volume that typically occurs in the fall, our Portland window installation experts find themselves very busy this time of year. Not only can window manufacturing lead times increase substantially, but our installation schedule can fill up pretty fast. To insure your Portland window replacement project can be completed before the holidays, and before the winter cold sets in, we recommend getting an early start. We offer a variety of online pricing options including price comparisons with actual jobs, phone consultations, email bidding, as well as in home consultations. Our goal is to provide you as much window pricing information as possible with the least hassle. We are pleased to offer product only packages for the do it yourself homeowner, as well as complete window sales and installation. 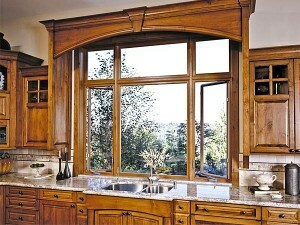 Windows Only is a certified Milgard Window Deal & Installer serving the entire Portland Metro Area. Whether you are looking to replace your old windows or simply have some questions about the process we are here to help. We believe that the process of upgrading your old windows should be as hassle free as possible. That is why we offer several options when it comes to getting pricing for your new Milgard Window Installation. We are one of the few companies who offers true, accurate online pricing. With some simple measurements and a few minutes of your time, we can give you an accurate window replacement quote. We truly embrace the “no pressure” sales philosophy. Like every other Portland Window Replacement Company, we still have estimators who can come to your house and talk to you about your options, and take the measurements to get you a quote. But with the ever increasing popularity of the internet and the lack of time that most people face these days, what better way to put your computer to work for you. We carry the full line of Milgard Windows and Codel Entry Systems. There is no job too small or too large for Windows Only. We have been serving the Portland Metro Area for over 20 years, and have not only gained the Milgard Certification, but have received the Angie’s List Superior Service award 3 years running. Your home is your largest investment and we know that you take that responsibility seriously, and so do we! 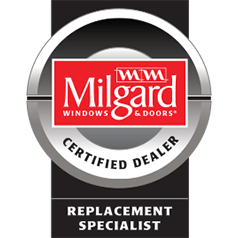 We offer a lifetime warranty on all Milgard Window Installations. Choosing the highest quality replacement windows means nothing if you do not also choose experienced window installers. Contact the Portland window replacement experts at Windows Only to ensure the job gets done properly. New windows enhance a homes comfort and beauty, improve safety and security, reduce noise pollution, and will substantially increase resale value. As compelling as these benefits are, they are becoming secondary to the primary reason most homeowners consider a window replacement project: Energy Efficiency.